The three-pronged digital push brings in new talents – including a three-year old boy named Alieyth. PARIS — Virgil Abloh is not done tearing up the luxury rule book. 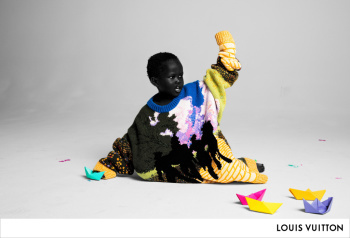 In his first advertising campaign as artistic director for men’s wear at Louis Vuitton, Abloh is launching a three-pronged digital push that brings in new talents — including a three-year-old boy named Alieyth, who appears in one of the first images set to break today to coincide with Martin Luther King Jr. Day in the U.S. The initial images are shot by Inez van Lamsweerde and Vinoodh Matadin, who previously worked with Vuitton on a 2012 ad featuring Arizona Muse. But for the next two phases, Abloh has drafted two outliers from the art world: Algerian multimedia artist Mohamed Bourouissa and Dutch photographer Raimond Wouda. The content, too, is unexpected. Instead of focusing on product, Abloh said he wanted to illustrate the values of his debut collection, shown in June on a 650-foot-long rainbow catwalk in the Palais-Royal Garden in Paris, in front of an audience of industry insiders, celebrities and fashion school students. “I’m not content with just designing clothes. I am more enamored with providing a premise of why my designs exist. Today it’s the context that is the punctuation on the object,” Abloh said in a statement provided exclusively to WWD, explaining his concept of campaign as manifesto. The first batch of images, and accompanying video, by Inez & Vinoodh, focus on the pre-teen and teen stages of boyhood. Alieyth is shown playing with paper boats in a too-large sweater from the “Wizard of Oz”-themed spring collection. 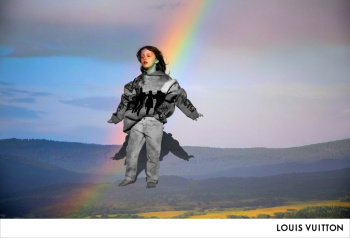 Child actor Leo James Davis, 7, who starred as a transgender child opposite Claire Danes in “A Kid Like Jake,” closes his eyes as he basks in a rainbow against the backdrop of a projected landscape, while 16-year-old Luke Prael, seen in the Boaz Yakin horror movie “Boarding School,” is pictured in a poppy-print jacket. Represented by the Kamel Mennour gallery in Paris, Bourouissa has shown his work at the Museum of Modern Art and the Centre Pompidou in Paris. 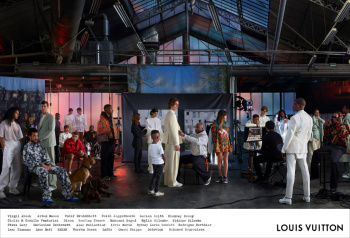 The image features Abloh taking the place of the artist in the center, flanked by members of his team, social circle and models, all wearing the collection. They include rapper Octavian; Australian stylist and Vogue Australia fashion director Christine Centenera, who styles his Vuitton shows; painter Lucien Smith; British designer, artist and model Blondey McCoy; Giulia and Camilla Venturini, the Italian twins behind the handbag label Medea; guitarist Steve Lacy; singer Sydney Loren Bennett, aka Syd Tha Kyd; British musician Bakar, and Bourouissa himself. Alton Mason, who concluded Abloh’s second Vuitton show this week with an impressive series of backflips, is joined by fellow male models Tuhir Brahmbhatt, Alec Pollentier, Warren Sossa and Omari Phipps, and female models Faith Jaggernauth, Lena Simonne and Lyne Hafi. The image, as well as close-ups, will appear in the only print ads for the campaign. 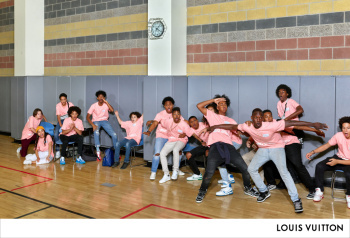 The third phase, set to drop on March 22, shows students dressed in the colored T-shirts that Abloh handed out to guests at his debut show. Wouda shot the images, intended as a contemporary take on the group portraits of Dutch Golden Age painting, in schools around Los Angeles. Speaking at WWD’s Apparel and Retail CEO Summit last October, Abloh said he wanted to upend traditional notions of what a fashion campaign should be. To be released on the brand’s web site and social media platforms, the ads break as Abloh’s first Vuitton designs are flying off store shelves. The collection landed in about 30 of the company’s boutiques on Jan. 18, racking up sales of $1.5 million on the first day at its flagship on Rodeo Drive in Los Angeles, according to sources. A pop-up in Tokyo that opened earlier this month raked in 30 percent more in the first 48 hours than Vuitton’s collaborative collection with Supreme in 2018, Vuitton chief executive officer Michael Burke told WWD last week. “It was merchandised as a full collection,” Burke said, also noting that the rush came despite no dedicated marketing campaign, advertising or gifting. About 1,000 people queued up in the Japanese capital to be among the first to buy. It just looks so MEMEmified, especially the fourth-sixth photo, all of which look like photoshopped pictures created by Siduations on Instagram. I actually like these, lol. I love these! Looks so hip. Very engaging. Very well executed! I like it too. Im actually no surprised that Virgil delivered the best SS campaign of the house, he is as good image creator (at least that) thats why millenniums like him so much and in a house like LV, with money and experience, I bet that more good thing are about to come in this particular side of the brand. Hope Nicolas start to fell the competition and change his campaigns routine, womenswear dont have a decent ad in a long time. Pretentious and ugly. I can't believe the brand has come to this. What have we come to? This is heinous. Definitely prefer the group shots, the studio kids shots are horrible, not selling anything to anyone. 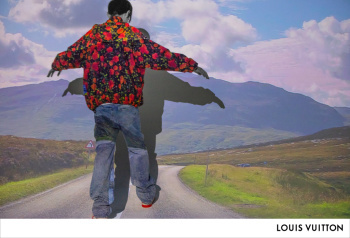 I love these group photos so complex and so visually stimulating EXCEPT I hate that they're for LV.... totally off brand and doesn't resonate with their buyers..
His clothes are still terrible but the Art Direction is superb! I didn't see this thread. This campaign is too united colors of Benetton. I don't like it. Fantastic ideal. Those images are great too. The campaign is the only good thing Virgil Abloh did.